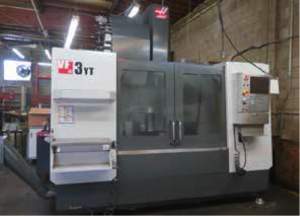 2014 Haas VF-3YT 5-Axis CNC Vertical Machining Center s/n 1112806 w/ Haas Controls, 40-Station Side Mount ATC, CAT-40 Taper Spindle, Haas Vector Drive Spindle, 8100 Max RPM, Rigid Tapping, 34-Position Coolant Spigot, Quick Code, Thru Spindle Coolant, 6277 Power ON Hours, 1341 Feed Cut Hours, USB Port, 18” x 48” Fixture Table Base, Coolant. 2006 Haas VF-3D 4-Axis CNC Vertical Machining Center s/n 1052885 w/ Haas Controls, 20-Station ATC, CAT-40 Taper Spindle, 20Hp Vector Dual Drive, 7500 RPM, 8mm Pitch Ball Screws, 208/220V, Chip Auger, USB Port, Front Tooling Racks, 18” x 48” Fixture Table Base, Coolant. 2005 Haas VF-3D CNC Vertical Machining Center s/n 46476 w/ Haas Controls, 20-Station ATC, CAT-40 Taper Spindle, Baldor Spindle Motor, 20Hp Vector Dual Drive, 7500 RPM, 8mm Pitch Ball Screws, Rigid Tapping, Chip Auger, Floppy Disc, 18” x 48” Table, Coolant. 2003 Haas VF-2D CNC Vertical Machining Center s/n 31892 w/ Haas Controls, 20-Station ATC, CAT-40 Taper Spindle, 20Hp Vector Dual Drive, 7500 RPM, Brushless Servos, 1mb Extended Memory, Quick Code, Delta/WYE, Rigid Tapping, Chip Auger, Floppy Disc, 14” x 36” Table, Coolant. Okuma Crown Type 762S-SB CNC Turning Center s/n 0239 w/ Okuma OSP700L Controls, 12-Station Turret, Hydraulic Tailstock, 7 ½” 3-Jaw Power Chuck, Chip Conveyor, Coolant. 2004 Femco HL-25 CNC Turning Center s/n L14-4492 w/ Fanuc Series 0i-TB Controls, Tool Presetter, 12-Station Turret, Tailstock, 7 ½” 3-Jaw Power Chuck, Chip Conveyor, Coolant. Okuma LB15 CNC Turning Center s/n 0209A077 w/ Okuma OSP5020L Controls, 12-Station Turret, Tailstock, 7 ½” 3-Jaw Power Chuck, Chip Conveyor, Graco Minifile Plus-SS2 Program Storage System, Coolant. Webb “Champ” Vertical Mill s/n 3126 w/ 3Hp Motor, 60-4200 Dial Change RPM, Chrome Ways, 10” x 50” Table. Webb “Champ” Vertical Mill s/n 3754 w/ 60-4200 Dial Change RPM, Chrome Ways, Power Feed, 10” x 50” Table. Bridgeport Vertical Mill s/n 192593 w/ 1Hp Motor, 80-2720 RPM, 8-Speeds, 9” x 42” Table. Amura mdl. 942 Vertical Mill s/n 79 w/ 80-5440 RPM, 16-Speeds, 9” x 42” Table. Kempsmith “Master-Mill” No.3 Plain Horizontal Mill s/n 127544 w/ 25-1500 RPM, Auto Feeds, 5Hp Side-Mounted Secondary Head, 12” x 79” Table. US Burke Horizontal Mill w/ Pneumatic 12” 3-Jaw Chuck, Dodge Motor Speed Controller, Arbor and Support. Van Norman Horizontal Mill w/ 40-Taper Spindle, 6” x 26” Table, Arbor and Support. Webb mdl. 17GX40 17” x 40” Geared Head Gap Bed Lathe s/n 9-801102 w/ 32-1800 RPM, Inch Threading, Tailstock, KDK Tool Post, 5C Collet Closer. Cadillac mdl. 1733 17” x 33” Geared Head Gap Bed Lathe s/n 867049 w/ 32-1800 RPM, Inch Threading,Tailstock, KDK Tool Post, 10” 3-Jaw Chuck, Coolant. LeBlond Regal 16” x 36” Lathe s/n 4C575 w/ 45-1800 RPM, Inch Threading, Tailstock, KDK Tool Post 10” 3-Jaw Chuck. LeBlond 15” x 24” Lathe w/ 54-490 RPM, KDK Tool Post, 10” 6-Jaw Chuck. Logan mdl. 920 11” x 24” Lathe w/ 4-Speeds, Inch Threading, Tailstock, KDK Tool Post, 5C Collet Closer. Sunnen ML-3500- D Automatic Precision Honing Machine s/n 3Y1-1047 w/ Sunnen Controls, 200-3000 RPM, Power Stroke, ASC Sizing Probe, Adjustable Finish Feed Force, Auto Stone Wear Compensator, Sunnen AG-300 Bore Gage, Coolant.Sunnen LBB-1499 Precision Honing Machine s/n 1233 w/ Sunnen AG-300 Bore Gage. Sunnen LBB-1299 Precision Honing Machine s/n 13430 w/ Sunnen AG-300 Bore Gage. K.O. Lee mdl. BA900 Tool and Cutter Grinder s/n 7906-10- 62 w/ Compound Work Head, 5 3/8” x 27”Table. Delta/Milwaukee “Toolmaker” Tool and Cutter Grinder w/ 5” x 27” Table, 5” x 10” Magnetic Chuck. Apex mdl. 20-D 20” Pedestal Disc Sander. Telesis Technologies mdl. TMC400/1700 CNC Engraving Machine. Landa “Spin-Jet” Automatic Heated Parts Washer. Pro Ultronics mdl. PRO3624 Ultrasonic Cleaning Tank s/n 362400363 w/ Digital Controls, 36” x 24” Tank. Lempco mdl. RF “Reamer Drive” Deburring Machine. Grob 4V-18 18” Vertical Band Saw s/n 2021 w/ Blade Welder, 40-5000 FPM. Wells mdl. 600 7” Horizontal Band Saw w/ Manual Clamping. F.A. Nugier H-40 40-Ton Sliding Ram Hydraulic H-Frame Press s/n 2722057. Deep Hole Drill Press w/ 8-Speeds, 5 ½” x 15” Table. (3) Wilton and Rockwell Pedestal Drill Presses. CompAir Hydrovane Rotary Vane Air Compressor w/ CompAir FC Refrigerated Air Dryer, 120 Gallon Tank. Kellog Horizontal Air Compressor (NOT RUNNING) w/ 120 Gallon Tank. 2014 Haas TR-160- 2 2-Axis Dual 6 ½” Trunion Rotary Table. (3) Troyke mdl. TDL-10- 2 2-Axis Dual 10” Trunion Rotary Tables w/ SMW ACcu-Smart 60 Servo Controller. Huot Toolscoot 40-Taper Tooling Cart. (2) 5” Angle-Lock Vises w/ Swivel Base. 12” and 10” Rotary Tables. (4) 10” 3-Jaw Chucks w/ Mill Base Plates. (60) R8 Tooling and Collets. Insert Turning and Mill Tooling, Carbide and HS Endmills, Form Cutters and Perishable Tooling. Immersion Micro Scribe GX2 3-D Modeling Digitizer w/ 50” Spherical Work Envelope, Pro/ENGINEER CAD Software. Fowler CV-600A Rockwell Hardness Tester. Bowers Fowler Holematix XT Digital Bore Mic w/ 5/8-3/4” Bore Head, 3/8-24 UNF(LH) and 7/16-20UNF(LH) Thread Heads. Bowers Fowler Holematix XT Digital Bore Mic w/ 1 3/8”-2”, 1”-1 3/8”,3/4”-1” Bore Heads. Mahr Federal Digital Air Bore Gage. (3) Mitutoyo 12” Digital Height Gages. (4) 12” Dial Height Gages. Mitutoyo 10” Vernier Height Gage. (15) Mitutoyo, Tesa and Brown &amp; Sharp 12” and 6” Dial Calipers. Fowler .4”-1.2” Digital Groove Gage. Mitutoyo, Starrett, and Fowler OD Mics to 6”. Starrett 0-1” Digital OD Mic. Mitutoyo 1.4”-2.5”, .7”-1.4” Dial Bore Gages. Mitutoyo, Starrett and Scherr Tumico Blade Mics to 6”. Mitutoyo and Scherr Tumico Depth Mics. Pin Gage Sets .011-.060, .061-.250. 36” x 36” x 4” 2-Ledge Granite Surface Plate w/ Roll Stand. (5) 18” x 24” x 3” Granite Surface Plates. Toyota 2FG14 3000 Lb Cap Gas Powered Forklift s/n 2FG14-15022 w/ 2-Stage Mast, 118” Lift eight,Pneumatic Yard Tires. Shop Carts, Work Benches and Shelving.